Luis doesn't give too many specifics, letting the cook be creative. But we've added a few notes for clarification. For the pastry dough, you can use store bought dough or even puff pastry. There are many dairy-free versions on the market. Or you can go for a homemade dough, like my buttery pie crust. I would omit the sugar, and you can use part sustainable shortening, if desired. Wash your hands. Put your apron on. Let’s cook! Have an adult heat the oil in a pan. When the oil is hot, add the red peppers and onions. Stir them around for 5 minutes. Watch out, it’s hot! Now, slowly add the meat, and mix it all together. Make sure you don’t overcook the meat. Stir the chopped eggs into the meat. Pour it all into a big bowl. It smells great! Add the olives to the mixture. Sprinkle on a bit of pepper and a pinch of salt (or to taste). Now, add a big pinch of the special ingredient: ground cumin. Cumin gives the empanadas their special taste. It’s going to be great! On a dry table, with dry hands, sprinkle some flour and roll the dough flat with a rolling pin. Use a cookie cutter to cut big circles out of the dough. Push and rotate the cutter to get the circles out. Shake the extra flour off. You can use a brush or use your fingers to put a little bit of water right around the edge. It’s like finger painting! Add some of the warm mixture to the middle of a pastry circle. Fold it over all the way so the edges touch. 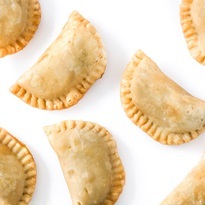 For a perfect empanada, use a fork to make marks around the edges. I think 20 should be enough. Do the same for all the empanadas and put them on a baking sheet. To make them golden brown, paint them with an egg yolk.